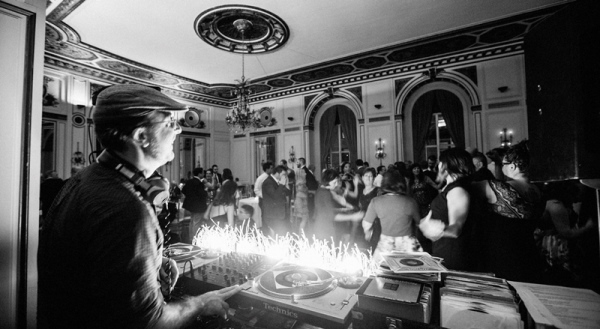 Dave has become increasingly in-demand as a wedding DJ, creating the soundtrack to nearly 100 successful wedding parties over the last several years. He typically plays a mixture of classic tunes loved by all generations to bring everyone together on the dance floor, singing along and letting loose. He is happy to meet with you to personalize the playlist as much as you possible, bringing 45s and LPs hand-picked to your taste. Afraid Dave won't have your favorite song on vinyl? No worries! He can also play songs digitally to make sure requests - even those received on-the-spot from your guests - can be accomodated. Contact Dave and he'll be happy to discuss more details with you. Looking for a sampler of wedding music? Dave made a 60s soul mix of wedding-related tunes, click here to enjoy it on the site or download the mp3s to enjoy offline! "Our guests still tell us that it was hands down the best music they had ever heard at a wedding! It really was a great dance party, and Dave even had non-dancers doing moves that they didn't even know they could do!"